Readers of a certain age may not fully appreciate just how new cellular and online technologies are. Though both seem more or less permanent societal fixtures, they’ve only really been around for, say, a couple of decades. Still, the market makes its voice heard pretty quickly, and 20 years is long enough for best practices to develop. 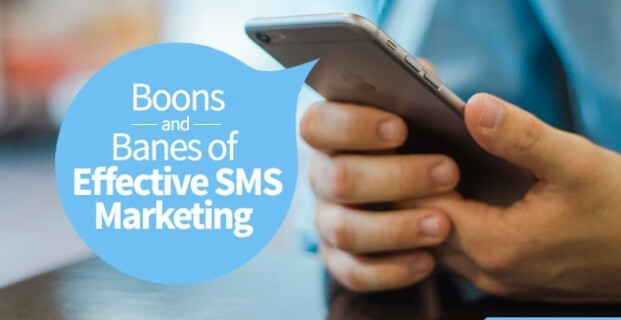 So if you want to pursue SMS marketing, make sure that yours is marked by the boons of a successful campaign—and not by the banes. Boon: Offering immediate value. In an incisive article published few years back in The New York Times, Tim Kreider noted, “If you live in America in the 21st century you’ve probably had to listen to a lot of people tell you how busy they are.” Yes, it’s a cliché and often a self-inflicted state, but it’s also true. Consumers don’t have a lot of free time. Unless your text presents something to them that they could use right now, it’ll likely seem irritating rather than advantageous. Bane: Looking sketchy or slangy. Were you aware that fraudulent online communications have their own idiom? We bet you can recognize it on sight. Consider the first two sentences of this email: “It is my pleasure to contact you for a business venture which I intend to establish in your country. Though I have not met with you before but I believe, one has to risk confiding in someone to succeed sometimes in life.” Yep, it’s a 419-scam email, a type of con so familiar that one magazine started a contest urging readers to pen their own crazy crank missives. The point is that your messaging should look exactly the opposite of scammy spam. Stay professional. Avoid acronyms. Don’t overpromise. And pay particular attention to our next point. Boon: Remembering Polonius’ advice. In Hamlet, Shakespeare’s notoriously mouthy character Polonius exclaimed that “brevity is the soul of wit.” Though the Bard was doubtlessly aiming for ironic humor with the line, that doesn’t mean it isn’t true. We dwell in the age of Twitter when the hoi polloi believe that most messages worth paying attention to should be communicated in 140 characters or fewer. So stay brief, and stay on message. Bane: Forgetting that mobile functions differently. Pop quiz: Is that web site to which you’re directing your target market optimized for smartphones? How about tablets? (Don’t forget that people sometimes receive texts on both.) If you’re trying to hawk an app, do you link to a single OS platform, thus isolating a large portion of your market share? Remember that mobile works differently from other sorts of marketing, and you ignore such differences to your campaign’s peril.